Praxis EMR is a highly flexible and unique electronic medical records solution that uses artificial intelligence technology, and thus eliminates the use of pre-conceived templates, pre-set catalogue of patients, diseases, findings and diagnoses, and pre-structured theoretical text cases . The software is designed with Concept Processing AI that allows medical practitioners to generate, customize, and share their documents and reports according to their own personalized style. Praxis EMR provides a unique approach in the management of medical and health records as it aims to move physicians and doctors away from the limitations and constraints of using drop-down menus and pick lists which are the common features of template-based EMR software. Serving the practices of independent physicians, and specialties which include medicine, family practice, pediatrics, urology, integrated medicine, pain management, endocrinology and more; Praxis EMR is beneficial for small to mid-size clinics, hospital affiliated clinics, IPAs, and ACOs. As explained in its knowledge- base, the technology applied by Praxis EMR has the capability to become smarter and more efficient as users continue to utilize it as they progress in their practices. A very prominent feature of Praxis EMR is the application and operation of the so called Agents. Agents function as AI messengers that enables doctors and physicians to do quick charting and send reminders to their staff. Agents are built into patient’s notes and they automatically store and access patient information and any pertinent medical data whenever the physician encounters a new patient but with a similar case. They operate based on the concept that cases can be classified into three types which are identical, similar but not identical, and rare. Hence, Agents would generate all the previous information and medical records that can be applied to the new patient making them instantly available for charting. Furthermore, they can be activated to trigger reminders to staff for schedules and since they are intelligent messengers, they would know when to deliver a message, to whom it will be sent, and on what conditions they will be perform a task. This software also allows accessing of Clinical Practice Guidelines which are made of rules and recommendations that physicians used in determining the diagnostic tests and treatment plans for their patients. Through the query engine and data mining tools of the software, users can easily develop queries without the need of technical knowledge. It is capable of applying both retrospective and prospective queries. In retrospective queries, users can easily access the appropriate recommendations depending on patient type which is based on demographic criteria, results of laboratory data, results of clinical parameters, medications taken, ICD-10s and CPTs. Meanwhile, since the software aims to accommodate the different and unique practice styles of doctors, when users introduce new recommendations that are not based from retrospective queries but rather he or she finds them appropriate for a particular case or patient, Praxis EMR would store this recommendation for prospective queries. Hence, it allows medical practitioners to improve their practice and deliver the best medications or treatment plans to particular cases or patients whether they are are rare or identical. Another feature of Praxis EMR is its Knowledge Exchanger, Through this feature Praxis EMR users can share their knowledge-bases with their experts peers who are also using the software as well as learn from the practice of others. This feature allows users to read those units of thought that are imported from an auxiliary library yet still maintaining their own knowledge base. They can use the content of these knowledge bases entirely or select only a part of them which they can adapt and add up to their own methodology and documenting process. With this feature, the art of practicing medicine is enhanced through the collaborative effort of providers. If you are interested in Praxis EMR it may also be sensible to examine other subcategories of Best EHR Software collected in our base of B2B software reviews. There are trendy and widely used applications in each software category. But are they essentially the best fit for your organization’s special needs? A popular software solution may have thousands of users, but does it provide what you require? For this reason, do not blindly spend on popular systems. Read at least a few Praxis EMR reviews and think about the elements that you want in the software such as the cost, main tools, available integrations etc. Then, select a few solutions that fit your needs. Try out the free trials of these products, read online reviews, get clarifications from the seller, and do your homework meticulously. This in-depth homework is sure to aid you choose the finest software platform for your firm’s special requirements. 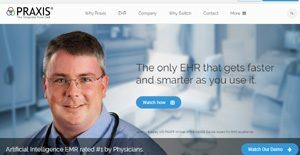 How Much Does Praxis EMR Cost? We realize that when you make a decision to buy EHR Software it’s important not only to see how experts evaluate it in their reviews, but also to find out if the real people and companies that buy it are actually satisfied with the product. That’s why we’ve created our behavior-based Customer Satisfaction Algorithm™ that gathers customer reviews, comments and Praxis EMR reviews across a wide range of social media sites. The data is then presented in an easy to digest form showing how many people had positive and negative experience with Praxis EMR. With that information at hand you should be equipped to make an informed buying decision that you won’t regret. What are Praxis EMR pricing details? What integrations are available for Praxis EMR?